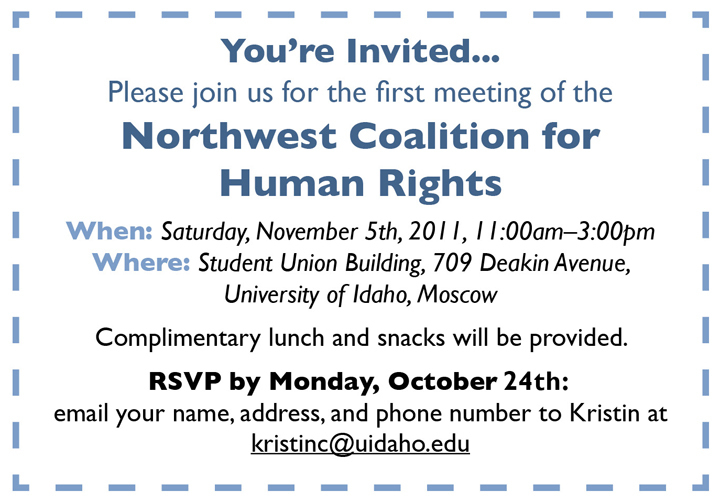 We invite you to join us for the first meeting of the Northwest Coalition for Human Rights (NWCHR) on Saturday, November 5th. * Together we will explore questions such as: What is the Northwest Coalition for Human Rights? Why is there a need for a regional human rights coalition in the Northwest? What are local groups doing throughout our region to promote human rights, social justice, and diversity? Who will be members of NWCHR and what will members do? Is there sufficient interest in the coalition to develop a vision, mission statement, and action plan for the Coalition? We also invite you and/or your human rights group to participate in this meeting by giving a brief, 10-minute presentation that answers the above questions from your unique perspective. Email Kristin at kristinc@uidaho.edu to schedule your presentation at the November 5th meeting. Membership Requirements: There are no requirements to be a member, save an interest in the various dimensions of human rights, a commitment to continuous improvement of the human condition for all, and a willingness to share knowledge and experience with each other as well as those who need advice and assistance. There is no membership fee, but members may choose to make voluntary donations in the future to help fund NWCHR-supported initiatives and events, such as conferences, training sessions, or education programs which will benefit residents of the Northwest. Members may also choose to volunteer their time toward the organization of such efforts. Key Benefits: The purpose of the Coalition is to come together to share information, develop linked strategies, and support our Northwest and especially our Inland Northwest communities. Many of us have been in the trenches of human rights advocacy for some time. Others are newer. But all of us can learn about and share techniques, tools, and programs, and work to further develop our skill sets to enable meaningful change in our communities. For example, when an event occurs—like the attempted bombing at the Martin Luther King Jr. Day March in Spokane last January—we can share information quickly and see if there is a need for additional support. These are the key benefits. Membership Profile: NWCHR members include students, educators, human rights workers and activists, community leaders and members, members of faith and interfaith communities, law enforcement and government officials, non-profit groups, educational institutions, service providers, and other such organizations. We come together because we believe we can make change happen. Together we are the Coalition. For each of our communities, there are always priorities amongst the range of human rights needs. We consider the scope of human rights activity to be broad, including the basic tenets of freedom of speech and belief, and freedom from fear and want. “Doing human rights” might include working for equitable access to a healthy environment, personal safety, affordable housing, potable water, education, and medical care, as well as standing against bias incidents and hate crimes. When priorities along these dimensions emerge in one community that another group has already tackled, sharing ideas and actions can be of great value. NWCHR’s intent is to facilitate such communication and sharing. As we all well know, these issues are often linked, and we need ways to address multiple needs simultaneously. Perhaps most importantly, the Coalition reinforces that we don’t walk alone on the path of human rights awareness and activism. The benefits and abilities of NWCHR will evolve as folks like you participate and help guide our Coalition. Administrative Home of NWCHR: The Office of Human Rights, Access, and Inclusion at the University of Idaho serves as the administrative home for the Coalition, providing a website, email address, mailing address, and phone number for Coalition inquiries, as well as part-time staff to help organize NWCHR and facilitate communication through the bi-monthly newsletter, “Connections & Communications.” The Coalition strives to build strong membership from throughout Idaho and eastern Washington, as well as from other parts of the Northwest region. Volunteers may be sought to act as contacts for NWCHR in a variety of locations in the Northwest. Details concerning the administrative aspects of the Coalition will be discussed among members at future planning meetings. 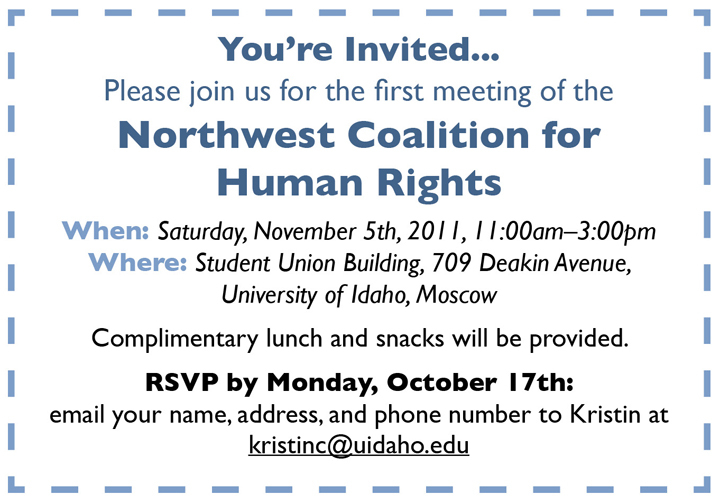 * The November 5th meeting will also serve as a follow-up to the Finding the Center Human Rights Conference, which was hosted at the University of Idaho on April 9th, 2011. Conference participants who completed volunteer Action Commitments in their communities as a result of Finding the Center are invited to give brief presentations about their projects, or to give general feedback on the trainings from the conference. Email Kristin at kristinc@uidaho.edu if you’d like to speak briefly about your Action Commitment. This entry was posted in Upcoming Event and tagged Coalition Building, Human Rights Event, NWCHR. Bookmark the permalink.